Grocery shopping is something moms do. I would guess my husband does about 3% of our grocery shopping. If that. I may have trust issues in this department… shocking. You can read more about my budget here. Just like cleaning, you have to get grocery shopping to work for you. YOU need to find a way to make it WORK for you. My system works for me. Here’s how I do my grocery shopping planning. I will say that if you’re in a position that you are either new to the “grocery game” or really need to build up your food storage I highly recommend the site “Deals to Meals.” It is great and they really do a good job of the ads around here (I live in AZ, in case you’re wondering). This is what I used when I moved here. I wasn’t aware of the prices in this area (and they are different) and it was a big help to figure out the stores. Also, when we moved I really needed to build-up my food storage, so I was trying to get a lot of different items. **ETA: since writing this, a lot of great free apps like Grocery Smart have popped up, you certainly don’t have to pay to get this service, but it might not be as pretty/easy. 1. You need to figure out your target price. I started making a “price book” a long time ago (I’d guess about 8 years). For the first month or so it was mostly me flipping back and forth trying to find out what good prices were. It takes 6-8 weeks for stores to cycle through their sale items, so it’s a great way to really find out what a good price is. I also did a trip to Costco without kids to find out their pricing on things. I wrote a lot of stuff down, and I’m sure I looked crazy, so don’t be afraid to look crazy. 3. I go through all the ads and I even pick up one online. I figure I might as well. 4. I just write down the price on food that is at a good price (so, initially you’re going to write a lot more — you’ll start to figure out the target price). I write down more then I’m going to buy usually. ** Previous to all of this I have written down items that we need from our food storage. Items that we REALLY need just go on the grocery list. Items that aren’t quite as necessary go on a list to scan for a good price on (you can read more about this below). 5. I then pull out a grocery list. I write down the items we need (this is usually pretty limited, as I try to keep a stock on hand of things we “need” so I can wait to buy stuff til’ it’s on sale). Then I go to the crazy coupon lady and search for coupons on the items that are on sale. So, let’s say I’m going to buy Hillshire farms sausage. I’ll just search for (control+f) “Hillshire” and see if there are any coupons. I do have a small coupon book that I got from the dollar store that stores coupons I get in the mail or with the paper. We don’t actually subscribe to a paper so these coupons are pretty limited at this point. 6. Walmart price matches. And no, you don’t need an ad. So, I see salad is on sale at Basha’s, it goes on the list. Chili is on sale at Fry’s, it goes on the list. I have a little “code” I use on the list to show which store has it on sale and I write the price next to it. It is seriously just that easy. I don’t bring ads. They specify you dont need them and when they’ve questioned me they’ve always had the ads nearby so I’d rather not carry them with me. I do write down the ounces for the sale as that’s REALLY important. You need to exactly match what’s on sale. ** Honesty is imperative with this policy. I don’t want to it to change, I LOVE not having to go store to store to stay under budget so I’m sure that I’m price matching the right way. Please make sure you do too! Honestly, I don’t get questioned a lot but I look pretty prepared. I not only have stuff written down on my grocery list, but I also bring my little price notebook to refer to (which has ounces written down) in my bag in case I need it. **I used to make my meal plans off what was on sale. And I still do that, to a point. It’s often based on what produce is on sale (Food City has great produce deals, and I have to look at their ad online as I don’t get it at my house). Now it tends to be on what’s well stocked (or over-stocked) in my pantry. I also head to Trader Joe’s, Sprouts or Costco for much of my produce. Not a huge fan of the Walmart produce isle. So, as you can see I go through my pantry once a month. I highlight items in red that we NEED. I will buy those on my next trip. Items in orange are things I should probably get at some point during the month. I scan the ads especially for these items. Yellows are other ones I should also keep an eye on. I still buy items that aren’t highlighted. I don’t usually highlight until at least 1/2 of my supply is gone. When stuff is on a good sale I want to fill up my “want” amount. I try not to go over unless the sale is AMAZING and I do have some overflow room if I really think it’s necessary. Over-buying is a big issue for me so having a set number really helps me stay in my budget. My “need” column depends on a couple of things. a) How much we truly go through and actually need, this sometimes fluctuates so I will change the number if I feel like we’re not going through the stock like we used to. b)How much room we have. I’d get like 100 cans of beans if I had enough room. I just don’t, so I’ve put a number that takes into account our need and the space. My husband even set-up the excel list so that it takes the “want” and minuses the “have” and comes up with the “need” automatically. If anyone wants this file please email me. I’d be happy to send it to you. Also, if you would like some help on target prices let me know what items you’re wondering about and I’ll do another post about that. Grocery shopping can save you a LOT of money if you take a little time to do it right. MomHack it. 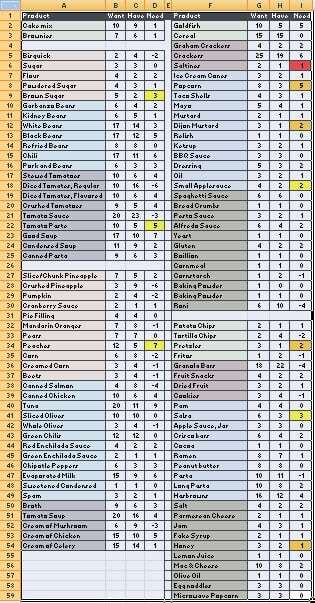 **I did an update to my plan, that isn’t as thorough, but shows a little bit about going through the pantry and how I work that into my grocery routine. I also did a series on my target pricing here. **So many people wanted me excel file I just made a new post here. You’ll find the google drive link there. Wow. That chart is awesome. My pantry is bare. The end. Does Walmart price match winco? Do you ever go there for canned goods? Our prices in Fresno are, as a general rule, higher than they were in AZ and winco is a drive for me, but I have yet to find prices on things like beans and tomatoes that are lower than winco, even on sale. Just wondering how that compares to walmart. I usually do a trip to winco once every 4 to 6 months to stock up. 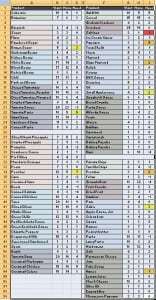 I added the link to the excel spreadsheet in the post, if anyone is looking for it. Also, Amber — Walmart doesn’t price match Winco, because as far as I know they don’t print an ad. I shop exclusively at winco partly because their prices are always the lowest and partly because they are employee owned. We have a family of seven and I feed us on around $800 a month. Sometimes a little more, sometimes a little less. I never look at ads or do coupons. Most of what we buy doesn’t ever have a coupon lol! I keep our food budget in check by making everything from scratch. We don’t eat processed foods and we rarely eat meat since half if is are vegetarians. Not buyin meat is a HUGE money saver. I also save a lot of money by growing as canning my own produce. When I want to make spaghetti, already having home canned sauce saves us money. In the summer and fall I rarely buy produce. We drink water, coffee and tea or we make our own lemonade in the summer. We don’t buy juice or milk unless I need it for a recipe. I’m quite thrifty by doing it myself as opposed to buying ready made and I feel better knowing exactly where my kids food came from. 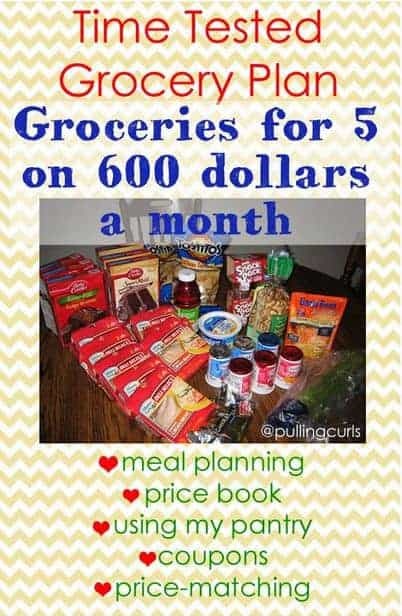 That’s what works for this mom on a budget! Omg, I love the want and need chart your husband made in Excel, such a clever idea! I do understand how excel works, so I am going to use that idea, thanks! Yay! It is so handy!